Extra virgin olive oil is the backbone of the Mediterranean diet and lauded for its health benefits. But when it comes to cooking with it or drizzling it on our food, is there really a difference between a generic bottle that you can get for $5 and a $39 estate oil made with a single olive variety? First, it’s important to understand that in order for an olive oil to be labeled extra virgin, it must pass chemical and sensory tests that act as indicators of quality. Specifically, it must be an oil with zero sensory defects and a free fatty acid content of less than 0.8 percent, which are standards set by the International Olive Council in Madrid. The tests are performed by labs and specially trained sensory panels (ideally recognized and certified by the likes of IOC or the American Oil Chemists’ Society). While the majority of oils labeled extra virgin will undergo relatively fast and inexpensive chemical tests, most won’t be scrutinized under the more costly sensory test before it reaches shelves. This means that not only is there a wide range of quality in the extra virgin olive oil category, but there are oils out there that shouldn’t even be labeled extra virgin in the first place. When it comes to producing high-quality extra virgin olive oil, “the most important thing is everything,” Nicholas Coleman, co-founder and oleologist at Grove and Vine, told HuffPost. From maintaining the grove to picking the olives at just the right moment to processing the fruit and getting the oil into the hands of the consumer as quickly as possible (fresh is best), each step must be meticulously carried out to preserve the quality of the oil. These efforts cost the producer time and money. When producing a premium product, quality trumps quantity and comes at a cost. “There tends to be an inverse correlation between quantity and quality,” Coleman said. For example, some producers will prune their olive trees so that all branches will receive equal parts sunlight and oxygen, which decreases the amount of fruit the tree will bear, but maximizes quality, he said. There’s also an increasing trend for olive oil producers to pick early in the harvest, while the olives are still green. In doing so, the producer captures the vibrant, robust flavors and aromas and higher levels of healthy antioxidants of the olive, but dramatically decreases their yield. A later harvest yields more oil, but it’s more “delicate, sweet and ethereal, and it will have a shorter shelf life,” Coleman said. Lower yields are costly to the producer and an important factor in the higher cost of olive oil. Diamantis Pierrakos, head producer at Laconiko, harvests very green Koroneiki olives and yields just 1 pound of olive oil for every 8 to 9 pounds of fruit. He told HuffPost that if they were to wait another month or two to harvest, they could almost double the yield. Lucia Gamez, head of exports at organic olive oil cooperative Ecológica La Olivilla and producer of Dehesa de la Sabina, noted that while a standard yield for olive oil production is around 20 percent to 22 percent, the yield for their premium organic olive oil is 12 percent to 13 percent. “It all goes back to the way we do it,” Gamez said. The extra virgin classification requires free fatty acid content of less than 0.8 percent. Dehesa de la Sabina’s most recent harvest yielded far less ― 0.09 percent to 0.12 percent ― indicating a healthy fruit and defect-free oil. “We go through our groves and carefully select which olive trees can be harvested and which ones cannot,” Gamez said, noting that using imperfect fruit affected by climate, pests or other factors will add a defect to the oil. Additionally, as an organic producer, Gamez incurs extra costs when it comes to maintaining the complex ecosystem that allows the grove to flourish naturally, plus the cost of organic certification and the frequent audits that come with it. Harvesting and processing require precise coordination to extract the freshest juice. Once the olives are picked, to preserve quality they’re taken to mills as quickly as possible to be processed. As these olives sit in giant piles they begin to break down, resulting in a defect in the oil. At Dehesa de la Sabina, they work to ensure the time between harvesting and milling is no more than three or four hours in order to retain the organoleptic properties of the oil and ensure zero defects. This requires an efficient and costly logistics system of staff, machinery and trucks. Balancing quality and quantity also comes into play at the mill. While processing at higher temperatures will give a better yield, the oil loses nutritional value, aroma and taste. The longer the olives stay in the malaxation (crushing and mixing) process, the more juice is extracted, but excess friction can cook the olive oil and add defects, Pierrakos explained. 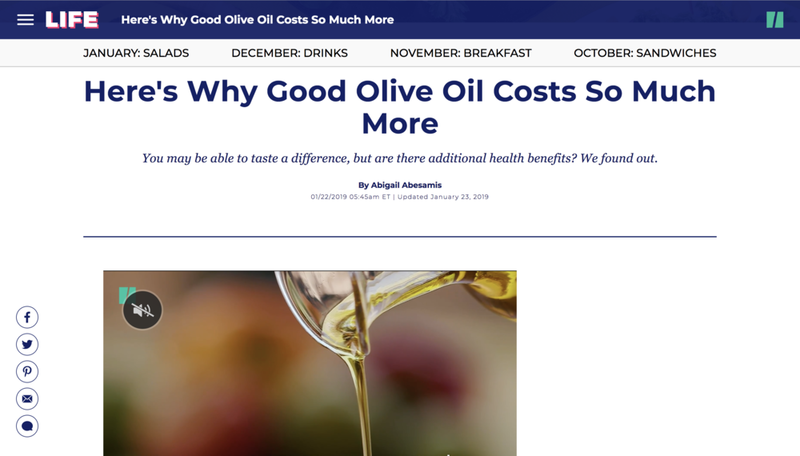 Does expensive olive oil have a different flavor and nutritional benefits? In terms of flavor, there is a distinct difference between high-quality and standard extra virgin olive oil. According to our experts, it doesn’t require a huge time investment to train your palate. Curtis Cord, publisher of Olive Oil Times, noted that a fresh, high-quality olive oil in most cases will be completely different to something you’ve randomly picked up in a supermarket in taste and aroma, from fresh fruit, grassy, floral and herbal notes on one end to smells like wet rags, mildew, hay or spoiled fruit (indicating a defect known as rancidity) on the other. For taste, “what you want is bitterness on the sides of the tongue, fruitiness throughout the mouth and a nice pungency on the back of the throat, which is a stinging sensation that indicates the presence of phenolic compounds,” Cord said. For health benefits, higher levels of phenolic compounds like oleocanthal and other antioxidants are nice to have, but the jury’s still out on the ideal amount. That means you will get polyphenols and antioxidants from any extra virgin olive oil deserving of that designation. So, even if a pricey high-end extra virgin olive oil is out of reach, you can still reap the nutritional benefits with a standard extra virgin olive oil. In addition to reducing inflammation thanks to phytonutrient oleocanthal, olive oil can protect against heart disease by lowering LDL and overall blood cholesterol levels and decrease blood pressure. Further, dietary research suggests that consuming higher amounts of antioxidant-rich foods may help protect against diseases.